The effect of coal industry supply-side reform themed on de-capacity and reduction production in 2016 exceeded the expectation while in the deepening year of the reform in 2017, how is the overall situation of China coal capacity? How many coal capacities have been closed and withdrawn by different provinces? How does coal market perform in terms of supply & demand, price, and imports & exports? In the medium and long term, what capacities will be gradually shut down in 2018-2020 and what newly-added capacities will be put into operation? What impact will supply-side reform bring about to the development of the coal industry? 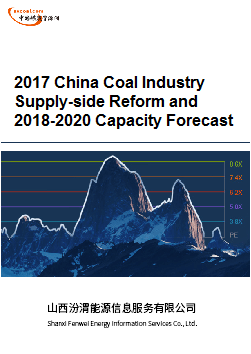 In response to these issues concerned by people in various sectors, Fenwei is compiling 2017 China Coal Industry Supply-side Reform and 2018-2020 Capacity Forecast presented in PPT.